Established in 2013 but with many years of experience behind me, I provide professional low cost Mobile Disco packages and entertainment across Hertfordshire. I offer my DJ service at a price that is right. Rest assured, you will get a top-class DJ service when I work at your event. Pay less with us and get a service that is trusted and proven by many. Chris was so professional from the first contact I had with him, through the booking process to providing the most amazing job of entertaining our guests on NYE. 100% recommend. Chris was my DJ at my 50th, he played great music and made my party so memorable. Cheers Chris! Chris was the dj for my wedding and he was brilliant, he was able to get everyone to the dancefloor and we had such a great fun! Amazing DJ highly recommended. Loads of our guests commented on how good the music was! Chris was our DJ for my husbands surprise 50th Birthday Party last night. The music he played was fantastic. He had everyone up dancing. A great night was had by all and I would highly recommend him. Chris was a brilliant dj !, went to a 50th birthday party last night he played music for all ages and everybody was up on the dance floor. Fantastic night definitely recommend ! Chris was superb. We asked him to DJ our wedding reception, and he did a fantastic job. Great selection of music, all of which contributed to some fantastic memories. 10/10 would definitely hire again. Thanks for contributing to a special evening, such a good variety of music brilliant lights/set up. Everyone danced all night long, thanks to your track selection and being flexible with different tastes of music. Chris was absolutely brilliant. He got the crowd going with classics from across the 60s,70s and 80s and played lots of requests. My parents had a great 60th birthday party and it wouldn’t have been the same without Chris and his music. Fantastic DJ. The best money you will spend on a DJ. Floor full all night long. Great mixture on music from all years !! Chris was the DJ at my daughters 21st, he is extremely professional and managed to put a great night together with very little notice. I would happily recommend Chris for any occasion, he aims to please and we couldn't be happier with the way the night went, thank you Chris! Very good DJ great selection of tunes. Booking St Albans DJ Hire is the easiest part. Simply fill your details into our short, easy-to-understand enquiry form which can be found on this page. You can also call us with your enquiries on 07960 476124 to check our availability. If you need more hours, call for a quote and I will provide you with a price estimate that matches your needs. If you need an event covered, contact me and see if I can take on your job. I have Public Liability and all my equipment is PAT tested yearly. I am a full member of NADJ. If you want to network, get in touch. Welcome to St Albans DJ. I am a Hertfordshire DJ Hire company based in St Albans, which was opened in 2013. I am the only DJ at the company, as I do not use others to cover my DJ jobs. 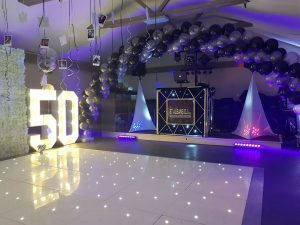 When I created my DJ company, the main purpose was to run a professional mobile disco service that would cater for everyone (hence my great packages at a very competitive price) and offer a top quality and reliable service you can trust. At St Albans Mobile Disco Hire, all my jobs are covered by a legal contract, protecting both of us. I offer FREE backups of all equipment – if there is an issue with a speaker or a laptop fails, I will have your disco up and running again within no time. 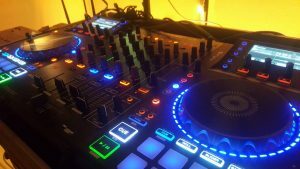 St Albans DJ covers all of Hertfordshire and surrounding areas. I am fully insured and Portable Appliance Tested (PAT tested) yearly and I am a full member of NADJ, the National Association for DJs. When you book my mobile disco service, you will be booking a trusted and proven DJ that offers the best mobile disco service money can buy. I like to give my clients a DJ service they will remember for years after and one they can recommend to their friends. My mobile disco service offers fantastic lighting and premium sound and equipment as standard. So, if you are looking for a mobile disco DJ to hire, I think I can deliver all your needs. I have over 20,000 tracks from current chart through to 60’s. I have worked many residencies since 2013, from 5 star hotels like the Best Western to local pubs. Whatever DJ hire entertainment you need, give me a call and let’s see if the date is available, as booking me means you will be in safe hands as I am passionate about music and the DJ industry. WHAT WE DO – WHY CHOOSE US? We are confident about the unmatched quality of our services, as being one of the most reliable and best performing value-for-money mobile disco services around. London Colney, St Albans, Herts. We are dedicated to delivering the most enjoyable, pocket-friendly show possible, to you and your guests – so why not choose us, today!